The Indigenous People of Biafra,IPOB, Thursday described the order proscribing it as ‘Black Market’ order and accused the Abuja Court which allegedly proscribed it on Wednesday of acting on bias and to impress the Federal Government of President Mohammadu Buhari, adding that the proscription will not stand. 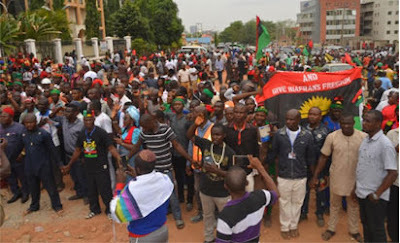 IPOB in a statement by its Media and Publicity Secretary, Comrade Emma Powerful said that, the its team of lawyers stormed the court of on Thursday to quash the order, but the Chief Judge Justice Abdul Kararati was not in court. We want to tell the world that IPOB under Mazim Nnamdi Kanu is not bothered about the alleged proscription, and we also wish to alert well meaning Nigerians and the world that the Chief Judge justice Dafarati of the Federal High Court Abuja was not on sit and duty today when he found out that IPOB team of lawyers stormed the Court Abuja to challenge the Federal Government obnoxious order obtained from his court. Justice Abdu Kafarati, gave order yesterday proscribing and labeling IPOB as unlawful and terrorist organization which brought much condemnation from well meaning Nigerians and the world. We are aware that the Nigerian Federal Government is resorting to all sorts of measure to frustrate us but we want to tell them we are not bothered about their obnoxious order proscribing IPOB, we will continue our peaceful agitations while they go on with their baseless and shameful proscription we do not recognize. IPOB lawyers stormed the federal high court today in Abuja to challenge the obnoxious order but unfortunately the chief judge went out of sit in other to delay and frustrate IPOB because he is fully aware the judicial blunder he committed against humanity. The chief judge was nowhere to be found in the chamber. “We are also aware that the black market order was a product of compromised by people who are bent on destroying the people of Biafra, but failed, they were bought over to prescribe and label IPOB a terrorist group. “The judge also knows the implications of what he did and that was why he chose to be out of sit to frustrate every efforts IPOB is making to challenge this order.